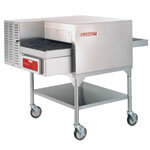 Pizza ovens, Dough mixers, Mincers, Slicers, Coldrooms, Fridges and Freezers. OUR BEST SELLING PIZZA OVEN! Don't forget to view our range of conveyor belt pizza ovens!